This topic has been discussed before as a problem with the seal between the "A" doorpost and the windshield. In my case, that wasn't the problem, but close. The symptoms were almost the same: at speeds above 55 mph I'd hear an annoying sound like something flapping in the wind inside the left air vent near the windshield. To fix it, I first fastened about a 7 inch piece of duct tape under the hole to fill the crack with the adhesive facing up. One edge of the tape is fixed to the under-edge of the black panel, and the other edge is fixed to the under-edge of the adjoining fender. Then I used black electrical tape on top of the duct tape, with adhesive side down onto the adhesive of the duct tape, to hide the fix. 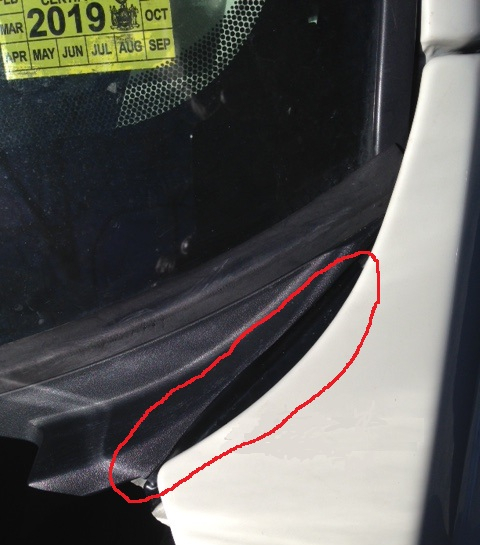 Result: filling the crack/hole with tape stopped the deep-throated whistling or flapping noise. This fix may be temporary, but it has stopped the noise for now. I took a picture to post here, but this posting tool won't let me attach it. When I click on the "Attach Image" option nothing happens. Sorry - I know a picture is worth a thousand words. Town & Country. Here's the pix - could only post as a comment. The marked area is where a rubber/plastic piece was missing, causing a flapping sort of whistling noise at speeds over 55 mph. I filled the hle/crack with duct tape and electrical tape, as described above, and got rid of the annoying noise. Above, it should say "hole/crack" not "hle/crack".